Elisabeth of Görlitz (November 1390 – 2 August 1451) was a Duchess regnant of Luxemburg from 1411 to 1443. Elisabeth was the only daughter and heiress of John of Görlitz, the third son of Charles IV, Holy Roman Emperor. He was Duke of Lusatia and Görlitz, and also Elector of Brandenburg for a brief period. Her mother, Richardis Catherine of Sweden, was the daughter of King Albert of Sweden. The Duchy of Luxemburg was mortgaged to Elisabeth by her uncle the King Sigismund of Hungary, who later also became King of Bohemia and Holy Roman Emperor. He was unable to repay the loan, and subsequently left Elisabeth in control of the duchy. Her first marriage took place in Brussels on 16 July 1409, to Antoine, Duke of Brabant. He defended her against three uprisings of the Luxemburg nobility, until his death in 1415. John of Bavaria was her second husband. He died in 1425, and they did not have any children. After his death, she became heavily indebted. In 1441, she made a treaty with Philip III, Duke of Burgundy, allowing him to immediately assume the administrative duties of Luxemburg and inherit the duchy upon her death. He agreed to this, but chose to launch a night attack on the territory two years later, taking immediate control. Elisabeth was subsequently expelled from Luxemburg by Philip's forces. Wikimedia Commons has media related to Elizabeth of Görlitz. 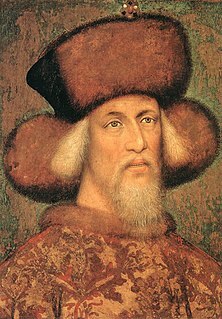 Albert the Magnanimous KG was King of Hungary and Croatia from 1437 until his death and member of the House of Habsburg. He was also King of Bohemia, elected King of Germany as Albert II, Duke of Luxembourg and, as Albert V, Archduke of Austria from 1404. Barbara of Cilli was the Holy Roman Empress and Queen of Hungary and Bohemia by marriage to Holy Roman Emperor Sigismund. She was actively involved in politics and economy of her times, independently administering large feudal fiefdoms and taxes, and was instrumental in creating the famous royal Order of the Dragon. She served as the regent of Hungarian kingdom in the absence of her husband four times: in 1412, 1414, 1416, and 1418. Adolph I of Cleves was the second Count of Cleves and the fourth Count of Mark. The Duchy of Münsterberg or Duchy of Ziębice was one of the Duchies of Silesia, with a capital in Münsterberg (Ziębice). Existing from 1321/1322 to 1742, it was located in what came to be referred to as Lower Silesia. Its territory is similar to modern Ząbkowice Śląskie County in Poland.